The founder of the Bizen Ômiya (備前大宮) School is generally thought to have been Kunimori (国盛). He was active around the Bun-ô (文應) era or 1260 during the Kamakura period. One theory says that he came from Inokuma Taigû a shrine in the Ômiya district of the Yamashiro Province, thus giving this school its name. Another theory says that he went to the Ômiya district of Bizen, hence the name Ômiya School. Whatever the reason, since works by the Kamakura smiths of this school are non-existent, the swords we today attribute to the Ômiya school date from the Nanbokucho era. Because they were made of exceptional length, most are mumei, ôsuriage today. Kunimori (国盛) was followed by smiths such as Sukemori (助盛), Moritoshi (盛利), Morikage (盛景), Moritsugu (盛継), Morokage (師景), Morishige (盛重), Moritsune (盛恒), and others using the Moro (師) and Mori (盛) kanji characters. 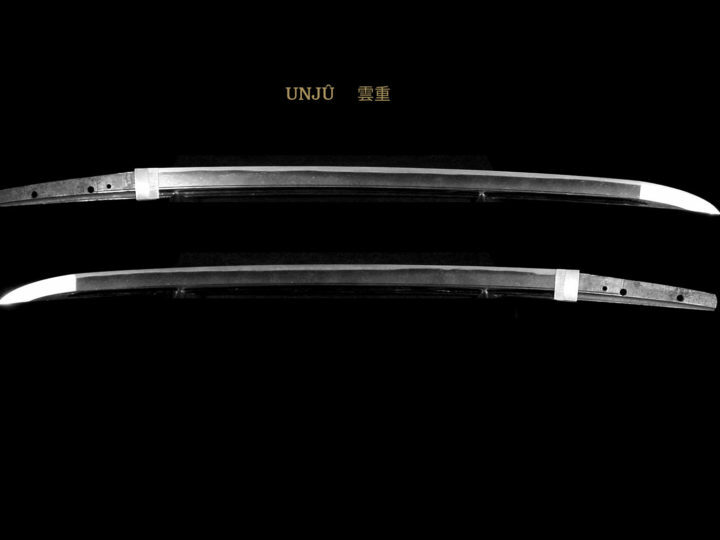 Most of the unsigned swords existing today that are attributed to a specific smith (rather than just to Den Omiya) are attributed to Morishige (盛重), Morikage (盛景) and Morokage (師景). Morikage (盛景) is said to have been the son of Ômiya Moritsugu (大宮盛次). He worked around the Enbun (延文) era or 1356. In the Meikan, Morikage’s (盛景) line is precisely recorded: the one who worked from Enbun (延文-1356) through Eiwa (水和-1375) is considered to be the shodai. The one who worked from Eitoku (水徳-1381) through Ko-ô (康應-1389) is said to be the nidai. Finally the one who worked from Meitoku (明徳-1390) through Ôei (應永-1394) is referred to as the sandai. Since there are only thirty-eight years in total encompassed between the beginning of Enbun (延文) and the beginning of Ôei (應永), and because the signature inscriptions throughout all these years are more or less uniform, a strong case for just one generation can be made. In fact, it is somewhat silly to attribute three generations in this short time span. The works of Morikage (盛景) of the Ômiya (大宮) branch were largely similar to that of Kanemitsu (兼光) of the main line. Upon close comparison, however, one notices differences in overall quality, fineness of the jihada, prominence of the utsuri, etc. This closely parallels the relationship and differences in the works of Kagemitsu (景光) of the main line and Chikakage (近景) of the branch line of Bizen Den during the Kamakura era. As a side note, we should note that there are signed examples where Morikage (盛景) signed with the long signature Bishû Osafune Morikage (備州長船盛景). The workmanship of these swords, especially the use of gyaku-tagane (reversed chisel strokes) show a closer relationship to the Osafune “branch” school of Chikakage (近景) and Yoshikage (義景). This would tend to indicate the possibility of a closer working relationship with the branch Osafune line than has been traditionally accepted. We must also take into account that such smiths as Morikage (盛景) or Moritsugu (盛継) also left signed examples where they engraved their large sized signatures with a thick chisel to indeed be in Kunimori’s lineage, and to be the true smiths in the Ômiya School. Thus, a new explanation on these different smiths has been put forth, which, has forced a re-examination of the explanations that have existed up to now. Morikage (盛景) left us many fine works including undated tachi probably from the Jôei (貞治) era 1362-1368 which has been designated to be a Jûyô Bunkazai. Another tachi dated Ôan hachi-nen go-gatsu hi (應安八年五月日) or 1375 has been designated a Jûyô Bijitsuhin. 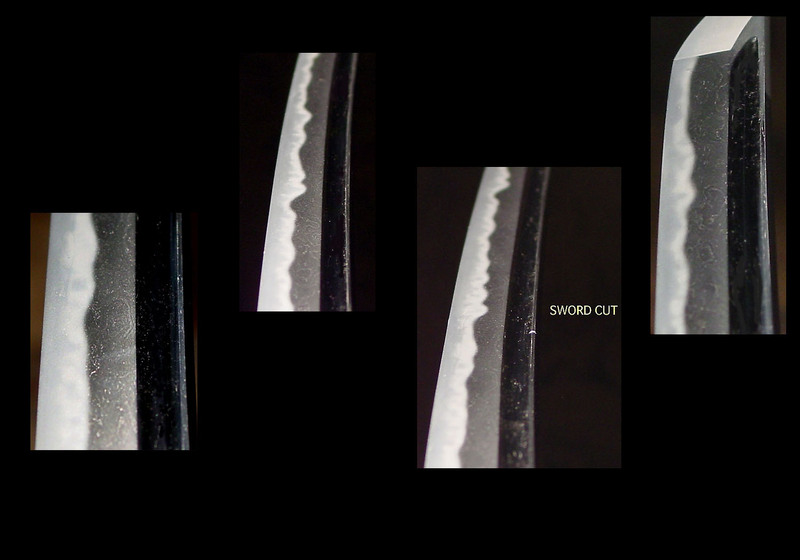 Sugata: Blades by Morikage (盛景) have a sugata that is typical of the Nanbokucho period. They are long, wide and thick with iroi-mune and the shinogi-haba is narrow. There will be very little narrowing between the width at the hamachi and at the yokote. Some have slightly extended kissaki and others have an ô -kissaki. The kasane will be relatively thick. The sori will be koshi-zori and they will have a very powerful feeling. Jitetsu: The kitae is itame mixed with mokume will be relatively tight but there will be areas of ô-hada here and there. There is ample ji-nie that will cover the itame and form areas of small tobiyaki. There will be an overall coarse feel to the ji-hada when compared to the works of the Kanemitsu (兼光). Midare–utsuri is often present and will probably be of a less uniform nature than that of Kanemitsu (兼光). 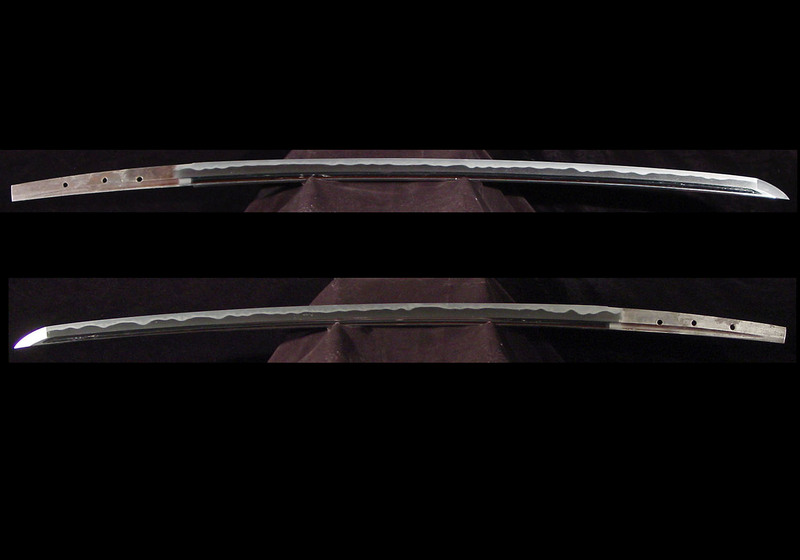 Hamon: The hamon will be nioi based, as is the case with Bizen works, but ji-nie will be present The hamon will usually be mainly notare based with a mixing in of gunome and/or ko-chôji gokoro and a midare-ba that has flamboyant variations. There will be ashi, yô, and sunagashi in the ko-nie structure. There are also works with hamon that are essentially squared-gunome, as well as works with an Aoe style suguha, so that his styles of workmanship are varied. Another point about his hamon is that the squarish gunome are much more outstanding and they are presented is such a manner as the place the atama (tops) on the same straight line. Bôshi: Most his works will have a bôshi that is boldly formed with a long kaeri combining notare-komi and a pointed tip. Occasionally, hakikake bôshi will be found. Nakago: The chiseling style of this smith differs from that of the Osafune mainline smiths’ in that the horizontal strokes start from the opposite end. This technique is called gyaku-tagane. This style of chiseling is also found in the works of Chikakage (近景) and Yoshikage (義景) who worked in the beginning and middle of the Nanbokucho Era. This would tend to indicate the possibility that Morikage (盛景) was influenced by this same line or offshoot of the Osafune School. The tip of the nakago will be kurijiri and the yasurimei will be kiri or katte-sagari. Horimono: Maru-dome bô-hi will be found as will soe-hi and futatsu hi. 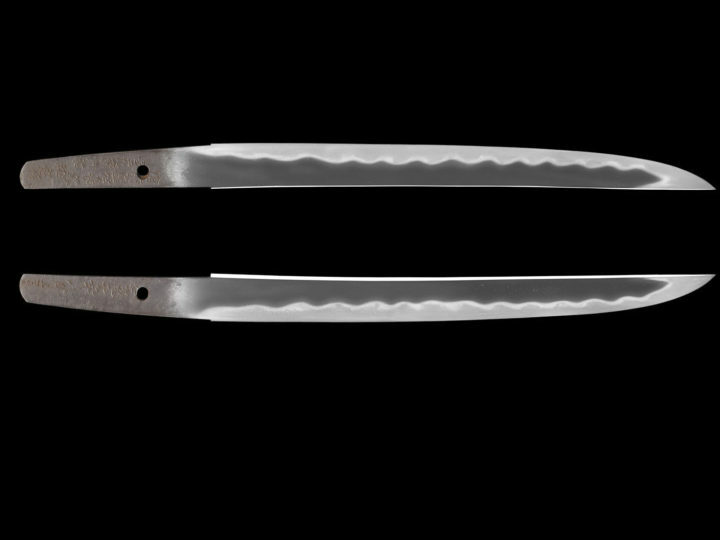 There are also blades with sanskrit bonji and sanko-tsuka-ken. Measurements: Length: 69.9 cent. ; Curvature: 1.4 cent. 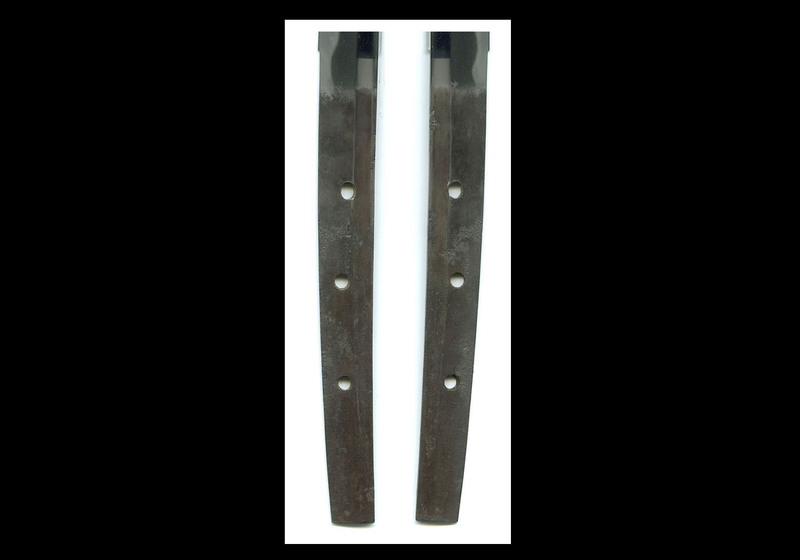 ; Width at Base: 2.8 cent. ; Width at Point: 2.1 cent. ; Kissaki Length: 4.0 cent. ; Nakago Length: 21.3 cent. ; Nakago Curvature: 0.1 cent. Characteristics: The construction is shinogi-zukuri with an iori-mune. The blade is somewhat wide, and the thickness is average. The curvature is shallow and the medium-sized kissaki is somewhat long. The kitae is itame mixed with mokume that has a prominent hada feeling. The jigane is covered in ji-nie with a mixing in of jifu, and the midare-utsuri is prominent. 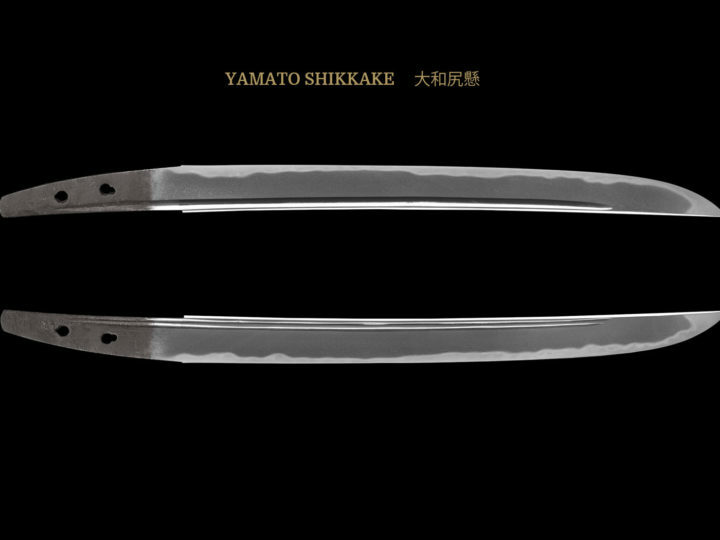 The hamon is a mixture of various type of hamon such as gunome, ko-gunome, togari-ba and ko-chôji. There is ko-ashi and yô activity. Although the habuchi is nioi based, it is covered in ko-nie, and there are streaks of sunagashi. There is also kinsuji activity and small tobiyaki. The bôshi is midare-komi with a ko-maru tip and somewhat long kaeri. 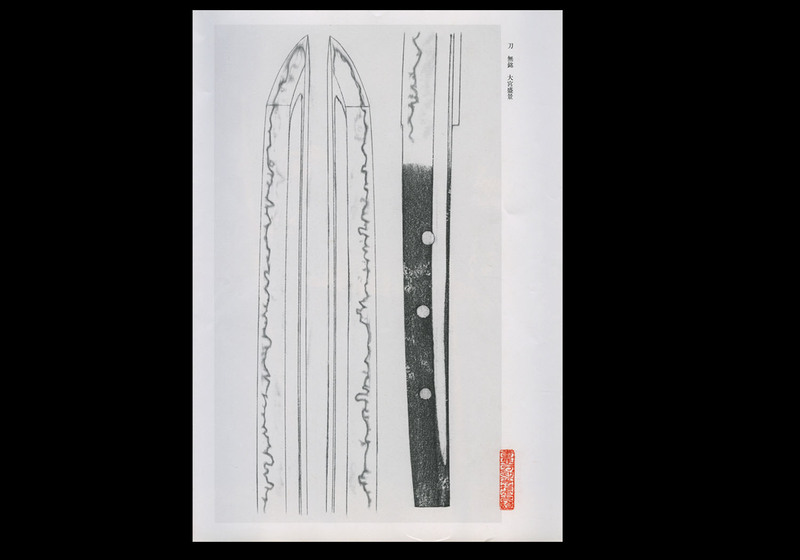 There are bôhi carvings on both sides of the blade that taper off onto the nakago. The nakago is ô-suriage, and the nakago-jiri is kiri. The yasurime are katte-sagari, there are three mekugi-ana, and the blade is unsigned. Explanation: The Bizen Ômiya School is said to have begun with the founder of this group, Kunimori (国盛), who moved from Inokuma Taigû, a shrine in Yamashiro, to Bizen. Although Morikage has come to be the representative smith of this group, he signed with such long signatures as Bishû Osafune Morikage (備州長船盛景), and, moreover, in recent years, based on such shared features as his style of workmanship, and the reverse chisel (gyaku-tagane) he used to engrave his signature, this smith has been placed in the lineage of such branch Osafune sword-smiths as Chikakage (近景) and Yoshikage (義景). Nonetheless, we must take into account that such smiths as Morikage (盛景) or Moritsugu (盛継), who engraved their large sized signatures with a thick chisel to indeed be in Kunimori’s lineage, and to be the true smiths in the Ômiya School. Thus, a new explanation on these different smiths has been put forth, which, has forced a re-examination of the explanations that have existed up to now. Morikage’s style of workmanship is broad with notare based hamon that have a mixing in of chôji or gunome and a midare-ba that has flamboyant variations. There are also works with hamon that are essentially squared-gunome, as well as works with an Aoe style suguha, so that his styles of workmanship are varied. 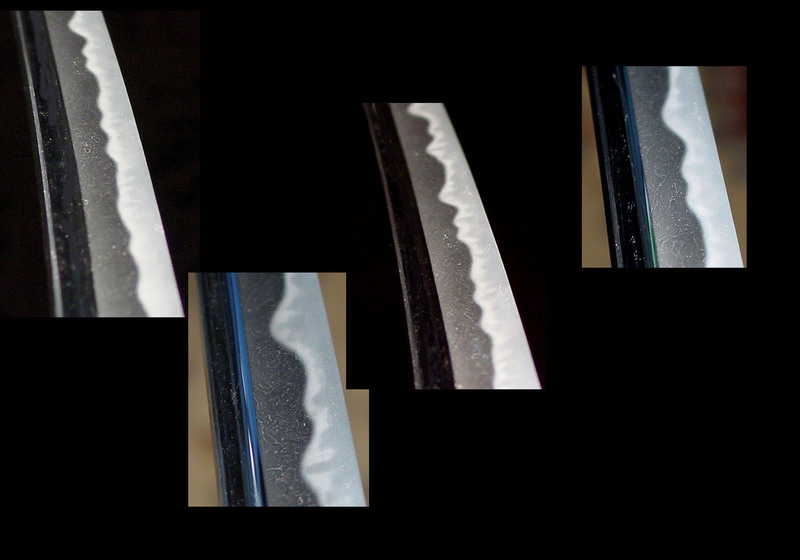 As for this sword, the kitae is itame mixed with mokume and a mixing in of jifu, and the midare-utsuri is prominent. 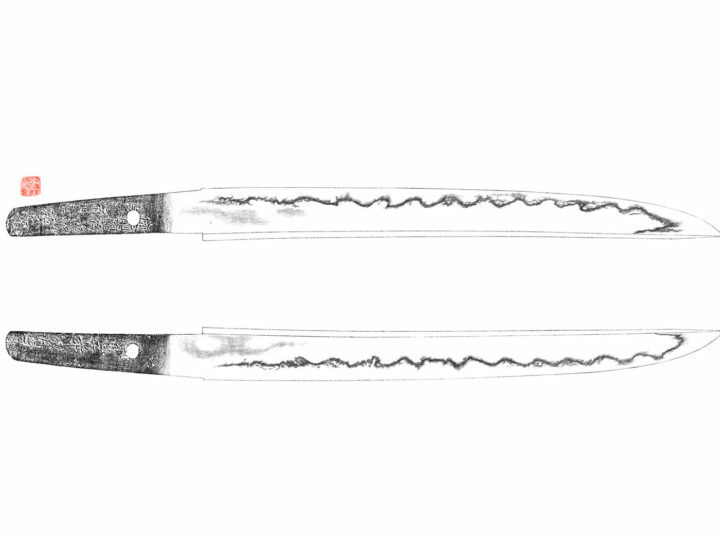 The hamon is a mixture of various types of hamon such as gunome, ko-gunome, togari-ba and ko-chôji. The yaki-ba can be seen as a midare-ba with variations, and as noted previously, these features display the characteristics in Morikage’s style of workmanship. Among similar swords, the workmanship is excellent, and both the ji and ha have no weak features, making this a very healthy blade.